My father's father died when I was 6 years old. One of the few things I remember about him is his love for old gas engines and tractors. 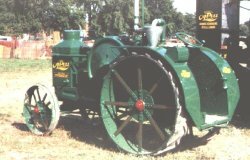 He loved to work on repairing them and displaying them at the Butterfield Threshing Bee . I remember sitting on my grandfather's lap as he drove this tractor in the parade at the Threshing Bee one year. My dad still owns it. Right now it is stored in a machine shed on the farmstead my grandfather and father owned. My dad built a shed on his land in Pratt recently and we've talked about hauling the tractor down from Minnesota. I would really like to clean it up and get it running again. This entry was posted in Misc on March 31, 2006 by Matt. First of all, I'm posting this from my phone so excuse the syntax and spelling. If I feel like cleaning it up when I get home I will. Two seasons ago when I was working for the company who shall not be named I scored some dugout suite tickets at Kauffman Stadium. I got these tickets through a vendor who was trying to sell me a Storage Area Network. Anyway, watching the Twins from literally next to their dugout was a blast. I took a good buddy with me (see viewofhope.org) and we wore our Twins gear and everything. We got to talk to Ron Gardenhire (Twins manager) and generally thought we were pretty cool. Ever since then, we've been talking about getting a group of our friends and families together to rent one of the dugout suites for ourselves. Until yesterday. I called the Royal's ticket office to check on pricing and availability. $4000 for one suite. And that only comes with 30 tickets ($75 per additional). Unbelievable. I think I'll stick to splurging on Club Level seats. This entry was posted in Baseball on March 30, 2006 by Matt. 'cause they think that it's treason. I was on the air a lot in college . It was something I really enjoyed and an activity I sincerely miss. The landscape of radio has really changed in the past ten years. The FCC has relaxed media ownership constraints numerous times in the past few years. This has resulted in an even greater homogenization of commercial, non-subscription radio. Syndicated talk programing constitutes the large majority of content on most non-music stations with a rapidly increasing dearth of local content. The major driving force in the industry is the economy of scale. Talk is cheap. Syndicated talk is even cheaper. Major media enterprises can realize significant profits by cutting news staff and resources at multiple stations and replacing them with a single talking head (complete with sycophantic support staff – not much assembly required). Ad revenues suffer few ill affects from this strategy allowing the handful of companies owning the large majority of stations to dramatically increase their margins. Local content and locally produced programming has almost entirely disappeared in all but the largest media markets. The syndicated replacements for this content are packaged and presented within a limited ideological scope for mass consumption. I think what I'm really driving at here are the extents to which the value of the content decreases as the "mass" aspect of the communication increases. I think that it is possible for messages distributed to large publics to have great inherent value. In commercial practice, the demands for profit can have great affect on value. I have not done "as I am told". I rarely listen to the commercial stations in my area. I get my local news content from the Wichita NPR affiliate KMUW . Kudos to them for actually producing quality local and regional content. This post is most definitely going into the Rant category. This entry was posted in Rant on March 29, 2006 by Matt. So, I've spent some time converting this site to WordPress. Thus far, I've been fairly impressed with the interface and layout. I found a decent, simple theme and made some minor modifications to it. I'm also testing out a new plugin that will allow me to spell-check. I have horrible spelling skills. If there is anyone out there actually reading this, let me know what you think. This entry was posted in Misc on March 28, 2006 by Matt. Buck Owens died on Saturday. Like a majority of people my age, I learned to know Buck Owens through the abomination that was Hee Haw. I seriously wonder sometimes what my parents were thinking when we used to watch that show as a family. It wasn’t really until the apex of Napster that I actually heard any of Buck’s hits. The “Bakersfield Sound” is one that I really like for reasons I’m not entirely aware of yet. They had a sound-bite from an interview Buck did with NPR on this morning and the gist of it was an explanation of the sound. Basically, Buck said he liked the straight-ahead guitars and driving drums. He also had a heck of a lonesome voice. I’m going to have to try and track down some more of his stuff. Thanks for the tunes Buck. This entry was posted in Music on March 27, 2006 by Matt.